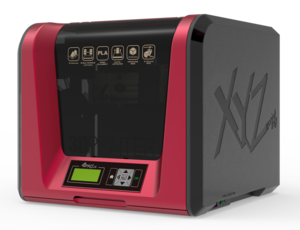 XYZprinting Da Vinci Junior 1.0 pro, la stampante 3D per lo studente e l’hobbista. Questa stampante 3D è pronta all’uso. Può utilizzare filamenti con diametro 1,75mm a base PLA di tutte le marche. Volume di stampa 15 x 15 x 15 centimetri. Our da Vinci Jr. 1.0 Pro is the perfect compact professional printer, with a desktop size that hides a robust build size of 5.9 x 5.9 x 5.9 inches. The printer is open source, compatible with third party 1.75mm PLA filament, and allows for the inclusion of an auto-feeding filament system. It boasts a resolution of 100 to 400 microns. The Da Vinci Jr. 1.0 Pro comes bundled with software that enables you to adjust multiple settings, such as speed, print support, and retraction. It has improved slicing speeds and is compatible with third party g-codes (CURA and SLIC3R). The 0.3mm diameter extruder is an optional add-on in the da Vinci Jr. series, designed for intricate prints. Capable of a 50 microns resolution, the nozzle gives a smooth and spectacular print surface, perfect for hollow and thin structures, and versatile print. Note: Stardard VGA driver on operating system, or a graphics card doesn’t support OpenGL 2.1, may cause unknown error in XYZware.